How close to the underside of the head do A325T threads need to be? The distance from the under-head bearing surface to the first complete (full form) thread, as measured with a GO thread ring gauge, assembled by hand as far as the thread will permit, shall not exceed the length of 2-1/2 threads for bolt sizes 1 in. 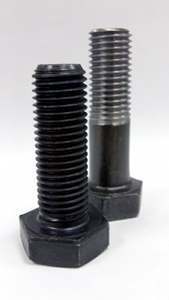 and smaller, and 3-1/2 threads for bolt sizes larger than 1 in. If you have any questions about A325 bolts or need any other help, please contact one of our helpful team members today.